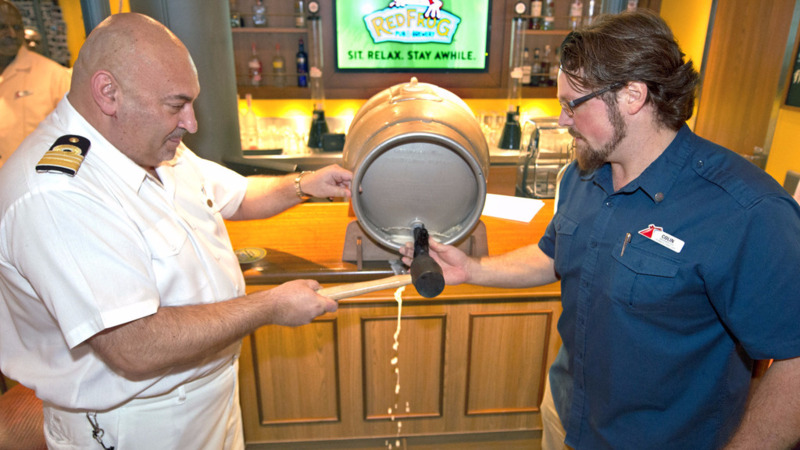 Carnival Vista brewmaster Colin Presby, right, and hotel director Pierre Camilleri tap a traditional 10-gallon firkin cast of the new Miami Guava Wheat beer Saturday, May 20, 2017, on the Carnival Vista in Miami. To celebrate American Craft Beer Week, Carnival Cruise Line has created a special one-of-a-kind tropical-flavoured beer served exclusively at Carnival Vista's RedFrog Pub & Brewery, the first brewery aboard a North American-based cruise ship. The new Miami Guava Wheat beer was unveiled last weekend at a shipboard ceremony during which Carnival Vista's expert brewmaster Colin Presby tapped the first cask of the new brew. Guests on board were the first to sample the beer, hand-crafted by Presby using the finest ingredients and inspired by Carnival Vista's Miami homeport. Miami Guava Wheat reflects the tropics with a light body and palate-pleasing notes of tangy pink guava, the primary ingredient in Miami's ever-popular guava pastries. "Since Carnival Vista began sailing from Miami, I've become fascinated by tropical fruit and Cuban cuisine so I'm beyond thrilled to create this new Miami Guava Wheat in honour of American Craft Beer Week for our guests to enjoy," Presby said. Available on a limited basis, Miami Guava Wheat joins the three other original draft beers brewed only onboard Carnival Vista - ThirstyFrog Port Hoppin' IPA offering aromatic, floral and hoppy notes with tropical and citrus overtones; ThirstyFrog Caribbean Wheat, an unfiltered wheat beer with flavours of orange and spices; and FriskyFrog Java Stout, a take on a traditional stout, rich and creamy with hints of coffee. The brewed-on-board beers are just several of the many innovative food and beverage offerings on Carnival Vista which also features the cocktail pharmacy-themed Alchemy Bar, the New England-inspired Seafood Shack, JiJi Asian Kitchen serving authentic cuisine from across the Far East, Fahrenheit 555 steakhouse, and Cucina del Capitano, a family-style Italian eatery. Other features aboard Carnival Vista include a groundbreaking bike-ride-in-the-sky attraction called SkyRide, the first IMAX Theatre at sea, Family Harbor featuring family-friendly accommodations and the Family Harbor Lounge, and vibrant Havana staterooms and suites with exclusive daytime access to a Cuban-themed bar and pool. 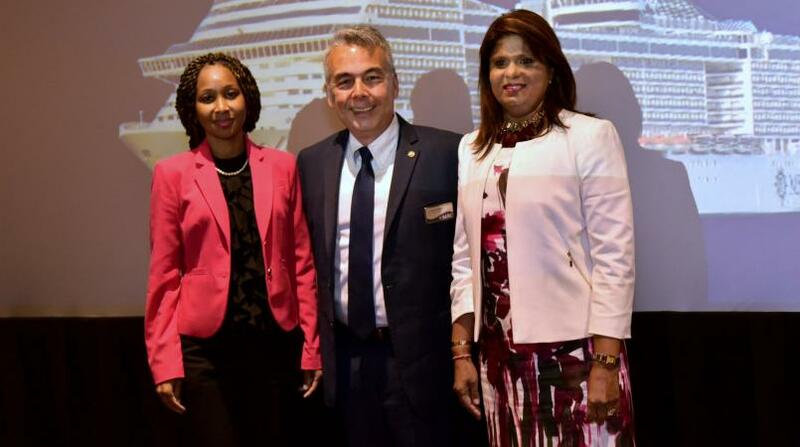 Carnival Vista operates six- and eight-day Caribbean cruises from PortMiami to the Caribbean and will shift to Galveston, Texas, in fall 2018 when its sister ship, Carnival Horizon, launches year-round service from Miami.